October 18-19: Space and Missile Systems Center Industry Day and Tech Expo (SMC Tech Expo), Los Angeles. Network emulation is a critical testing method used to validate application performance prior to deployment. The success of the Network-Centric Battlespace depends on the optimal performance of Command and Control (C2) applications. The network architecture between a Command Operation Center and its units in the field often involves multiple link types, including LTE, SATCOM, and traditional copper or fiber networks. These topologies can span great distances and network impairments such as latency, packet loss or congestion can dramatically affect application performance. 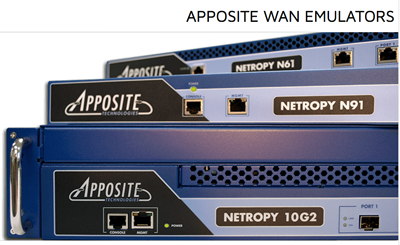 Many DoD and government contractors depend on Apposite Technologies’ network emulation appliances to validate the reliability and scalability of mission-critical applications. Apposite Technologies’ Linktropy and Netropy product lines can easily emulate a massive, worldwide network for testing purposes and the simple graphical user interface allows it to be done in minutes. By applying specific impairments to this emulated network, testers can observe their effects on application performance under real-world conditions, ensure mission readiness, and prepare for success.